Quiltville's Quips & Snips!! 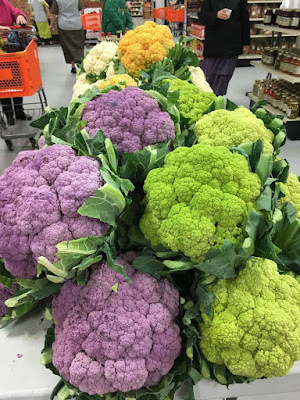 : En Provence & The 3-in-1 Color Tool. This post is for those who asked “which colors” from the 3-in-1 color tool are the “right” ones we need for the mystery. First of all, there IS no right one. Remember, any time that you choose a color palette you have to leave room for variety and variations. While paint chips and color cards can help you weed out shades that just won't work, for instance -- greens that are either too grey or too brown to go with the ones that are more yellow green, you will ALWAYS ALWAYS ALWAYS want to include fabrics within your color family that push the boundaries in both directions. Some darker, some deeper, some lighter. And sometimes, even a bit of CLASH is good. You may have chosen paint chips, but we are NOT painting a flat wall here. We want a quilt with life and depth, a quilt that shares who you are, what you like. I have often said that our personal stashes are as individual as our own signatures. Let your quilt make a statement that is as uniquely you as your own handwriting is. But paint chips and color tools are a GREAT place to start and very handy to have on hand for the initial choosing of color families that we are going to work with for our En Provence Mystery. Can you see the central shade on the chart with the white writing on it? This is the true shade. The shades on either side of the pure color are what happen when we lighten, darken, or start to push it toward the next color family in the color wheel. See how they get more purple toward the bottom? Lighter toward the top? The fabric from my stash was as close to the pure magenta as I could get. But it wouldn't matter if I chose a fabric that was a little lighter, a bit more purple. As long as I have contrast with the dark and light purples in the quilt, I'll be just fine. In your greens you are going to remember that green may end up next to yellow so you will want to stay with greens that are a bit darker. I showed THIS side of the 3-in1 color tool because I am including a variety of these greens -- BUT ---in the right hand column, see the grey-green grouping at the top? These didn't make me happy. The center grouping is a bit too light, but the bottom grouping is right in the range I am shooting for. If you look at the left hand column, about half way down in the center margin you will see the word PURE. Count PURE as number one, and count down 7 shades. These are all in the realm of what I used in my greens. When I lay this card down on my fabrics I can easily tell if something is "too blue" or "too grey". It really helps me. Our dark purple paint chip is somewhere in the realm of dark purple BETWEEN Red Violet and Blue Violet. Doesn't this remind you of all of the color crayon names in that new box you opened up on the first day of school? It does me! This is asctually the same card, just pulled the shade from the lighter side of the color family. Now look at the color wheels on this card! Do you see the Analogous wheel? Magenta and Purple are side by side! Now look at the second complimentary wheel at the bottom. Purple/yellow/green! Nature knew what it was doing when it put this beauty together! My light purples contrast with my dark purples much like this ad that popped up in the side bar of my Facebook yesterday! LOL! I guess our colors are all the rage! Find where it says PURE on the 3-in-1 color tool. We don't want to go TOO light with the yellows or they may not contrast enough with the neutrals in the quilt. Check the top right color wheel on the card. What is yellow complimentary to? PURPLE! You can go a shade to either side of the pure yellow, but this yellow still needs to contrast against your green as well as your neutrals. Prints are okay on the yellows. Other colors on the yellow as long as you can see the yellow background are also okay. I have found that having this handy tool in my hot little hands has helped me greatly with choosing and weeding out scraps when working on a quilt with a planned color theme. 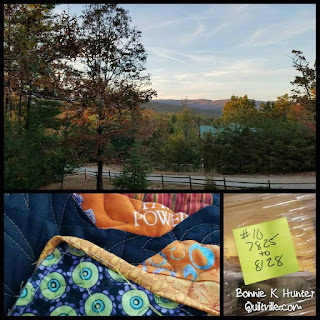 It has helped me choose complimentary, analogous and split complimentary colors that really bring life to a quilt when I couldn't quite decide what would be best. I've even used it when trying to decide which color of binding would be best on a quilt to set off what is going on within the quilt. Doesn't everyone need a little multicolored cauliflower in their lives? Especially if it is in the colors of En Provence?? Green, purple, neutral and yellow. The only thing missing is MAGENTA! Thanks, Pam. This was fun to wake up to this morning! Yesterday was a busy day in Quiltville. 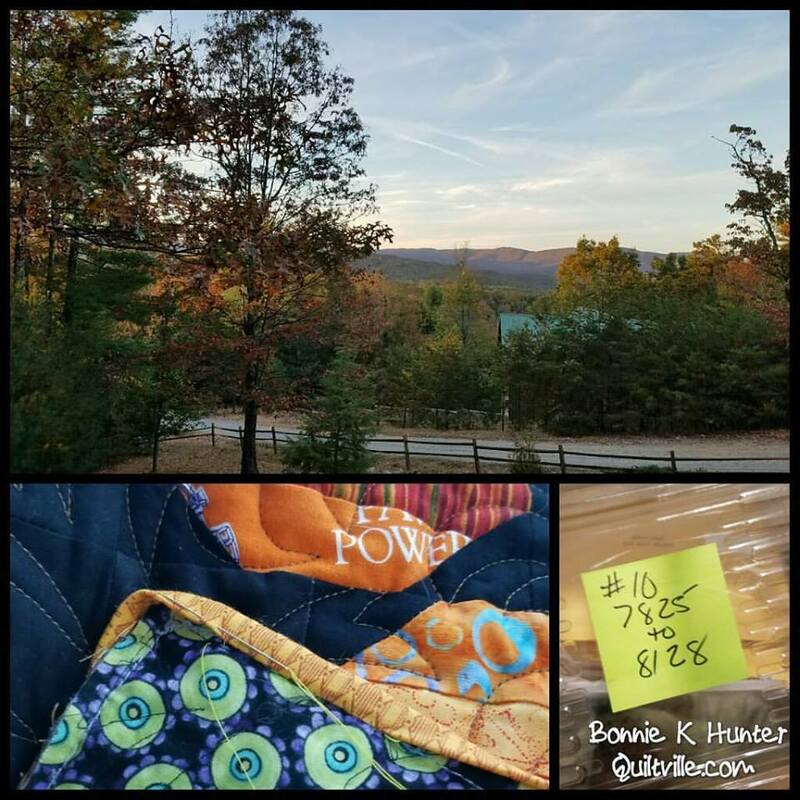 My thanks to the Hubster for helping me get invoice box number 10 out the door, so happy to say we are now all the way up to October 27th when I left for Quilt Market. We arrived at the cabin last evening right at dinner time, throwing steaks on the grill for dinner and just taking a breather. We are up here to meet with a realtor today and get our beloved place on the market. Something better awaits. Today we start to look at property. There are a couple things of interest that we want to see. I'm not having an easy time with this. How is it that other people outside of my family can have such an influence over my freedom and happiness. I am sure that SOMEONE will love the cabin as much as I have, and they will enjoy the "resort" type community that is slowly engulfing this mountain through the HOA board. But it just isn't me. It's not how I want to live. We are looking for a place with acreage and long range views. If the cabin we find doesn't have a large enough studio space, we'll have room to build me the dream studio I've always wanted. It may take some time, but one thing is for certain. The right thing can't come along until you let the wrong thing go. Letting go has always been difficult for me, but I'm doing it. Sometimes it is harder to move on than to stay put and just deal, but you have to KNOW when it is time to make the choice and do it. I look forward to sharing this new adventure with you. 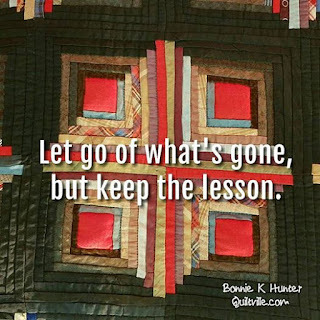 And I found it appropriate that this quote is on an antique log cabin quilt found at Quilt Market. 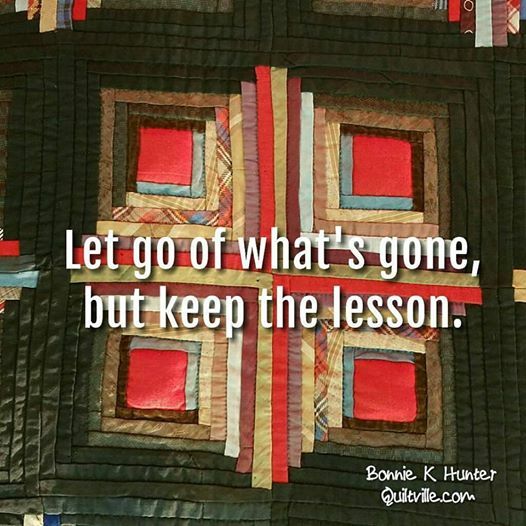 So many lessons have been learned at Quilt Villa. On to Quilt Villa II! Thanks for the color lesson. And Happy-Turn-Back-the-Clock Day! I love this day. It seems to go on forever. Makes for a very leisurely Sunday.Happy cabin hunting. I'm seeing the inspiration for the new quilt villa..... standing on your new porch, looking out over your acreage, whether a couple or 50... the color of the trees and sky being inspiration for a new quilt palette......Quilt Valley! Can you see it??? Have fun on your new search! The color lesson was great! While you are struggling moving on, your cabin has lead you to what you really want. Find that pefect spot in the mountains! Ditto. thanks for the color lesson. This may be one of the tips you share on the C&T thing you are doing. Thank you so much for the lesson. I've been struggling with whether to use my magenta FQ stash or buy yardage. This helps immensely. I love getting to see inside your quilting brain. LOL. Oh, and I did a jig when I saw the ending number of box 10, as I'm number 8127. Thanks for the color lesson Bonnie. I think I have a similar tool somewhere around here. There are still several bins in the garage of sewing room things. Must be out there. Having just moved, I feel that the packing and moving part is much worse than the leaving part. Thanks also for all your daily quotes. I think the make us all better people. I'm working on your Narragansett Blues quilt. I'm starting to see some progress! Have a great day and good luck with the house hunting. Bonnie, your color lesson is wonderful. On the Green Strip you may notice the CMYK designation. This stands for Cyan (a turquoise blue)-Yellow-Magenta-Black. Printers use a four color process and it is the percentages of all of these colors that make up the spectrum. The lower the number, the less of that color is included in the mix. I will need to order your color tool next. Thanks so much for everything you do for us. The log cabin block so beautifully illustrates your topics of color and Cabin. Thank you for sharing the lessons and the block. There is such beauty in both. Thank you for the insight. I really struggle with choosing my colors. Love your ideas and quilts. I know it's a ear worm for sure! But that's what we have to do sometimes to help us move on. What a great color lesson, Bonnie. Thank you! Thank you so much for the color lesson. I sat and read it over and over and looked at my piles of fabrics. I took some out and put more in and I am happier with my choices. Thanks so much Bonnie for the help with colors. Before your lesson today I was using the actual card named purple and wondering how my stash was nearer to violet even though I would have told you they were indeed purple...geez. I've got enough batik material to complete this mystery. The only thing questionable is my yellow. It's plenty bright with both yellow and golden yellow. Thanks again and good luck with house selling and buying. thanks for the color tips! I just got home from Houston.I KNEW you were just there for Market, but I kept looking for you anyway!! Silly me... Keep your chin up about the cabin. Reminds me of my quest for a long arm. I had 3 different machines and 2 diff frames before I landed on the one for me. I learned alot along the way and I would not have changed it. You have LOVED Quilt Villa, but the next one will fit better because what you want has been honed. On to stash dive as my feet cannot take anything else today! Can you say BLISTERS! owie! There's lots of space and beautiful views in Idaho! I really love it when you talk about the technical end of things, like this color lesson. Some of what you talked about was stuff I kind of knew instinctively, but I couldn't express or think about it in words. It's very helpful to have it verbalized. Thanks for explaining the color tool and how the Mystery colors relate. I ordered the color tool with the tri recs rulers so it will be fun to use when it arrives. I hope you soon find a cabin that makes your heart happy. The colors in Pam's picture are just gorgeous! Thank you for the links to the colour tool - much easier for your International friends to access than paint chips as we don't have "Lowes". For sure the perfect cabin/lot will come into view as you are open to it! Bonnie.. you never cease to amaze me!..I am so happy that you put the Colour Tool on the map. I recently taught a "Colour Class" with the Tool and it was very interesting to just talk about colour from an artist's point of view. I just have one comment about your "Green"... It seems that we would be using the "Yellow Green" Card # 3. but it is not in the picture. Am I correct? The "Green" Card #5 has quite a lot of blue in it and does not match the paint chip at all! Thank you for all you do for us! We are so happy to live in your world and to quilt along with you. Good luck in your search for the "right" cabin... I know it is out there waiting to be discovered by you and the "Hubster". Bonnie....Once again you have floored me with your "brilliance" you Most Amazing Woman! I have a terrible time with color. It is usually why it takes me so long to plan a quilt. You have made matching and choosing colors so much easier for me. Thank you, thank you, thank you! How brave and strong you are to leave your Quilt Villa. Do you realize what an inspiration you are to so many? Yet, save for the few bumps in the road you've encountered, you're enjoying it so much. Good for you! So glad to have "met" you! Thank you Bonnie! I have confidence in my cutting, piecing, paper-piecing, hand work, sandwiching, quilting with my standard machine (nothing fancy) and binding. But choosing fabric colors are my weakness, no confidence in that area. Your very detailed description of the how's & why's, 2 up & down, has helped me pull from my stash. Once more, thank you! Is the binding included in the yardage amounts for the mystery quilt? Bravo for having the gumption to let go of Quilt Villa in search of a new getaway. I look forward to you sharing your search with us. It's like watching House Hunters - Smoky Mountain Edition! You will know the right place when you find it; it will speak to you. Perhaps you should name it Quilt Villanova! Good hunting! I was happy to find a Sherwin Williams store in Halifax, N.S. My husband picked up the paint chips. They had all but the Magenta. It was only available in a three by eight inch colour board with all the paints chips they can produce. The salesperson gave it to my husband and said not to return it as they have plenty more. Guess I have chips for the next decade of mysteries. Now to find the fabric. I was gifted a 3 in 1 tool many years ago and never knew how to use it. I went looking for it and found it and once I dusted it off a bit I could easily follow your instructions. Thanks so much for the lesson.